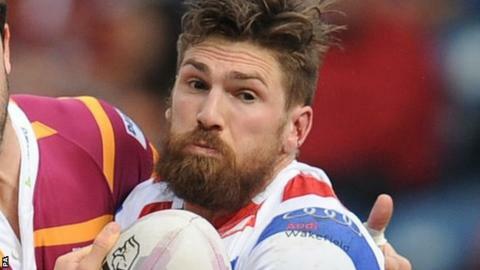 Wakefield full-back Jarrod Sammut scored his side's match-winning try and kicked three goals, as his side came from 16-0 down to win at Hull. First-half tries from Danny Houghton and Jordan Rankin, followed by Ben Crooks' 52nd-minute effort looked to have set Hull on course for victory. But Richard Agar's Wakefield produced a stunning fightback to end their run of five successive Super League defeats. Richie Mathers, Daniel Smith and Matt Ryan also crossed in the late comeback. Mathers started the revival on 57 minutes before a burst of three tries in seven minutes, the last of Sammut's three successful conversions being rounded off by Paul Sykes' late drop goal. Both sides had last weekend off after falling in the fourth round of the Challenge Cup and it showed as they struggled for fluidity with ball in hand. But Josh Bowden laid on the opening try for Houghton to go under the posts before Rankin supported a good break by Aaron Heremaia to score Hull's second try two minutes from the break. Crooks and Mathers then exchanged tries before tempers flared and Wakefield's comeback gathered momentum. Smith and Ryan crossed in quick succession before Sammut scored the clinching try and Sykes popped over a one-pointer to seal victory for former Hull FC Agar back at his old home. Wakefield's first win since 15 March moved them six points clear of the relegation zone. But current Hull coach Lee Radford, who revealed that Joe Westerman had suffered a suspected broken wrist. felt an altercation which saw Jason Crookes and Chris Riley sin-binned played into Wakefield's hands. "Credit to Richard Agar. He's got a bunch of blokes on the cheap, patched them together and come today and out-enthused us in every department. "I don't know what the answer is. I could have gone blazing in there but I decided not to. "You'd think the money invested would buy you some enthusiasm. As a group, energy wasn't there and, as a coach, I didn't get my team energised, obviously." "We feel we've been gradually piecing bits of our game together over the last couple of weeks. We pieced it together today for longer periods and we won in spite of getting very, very little come our way in the second half. "The first 10 minutes of the second half we were just blown away by some of the things that went against us. For our side to come back from that showed they certainly believed in each other. "It's going to be a tough year for us - we know that. We are a fairly new team. But the next couple of months is a really crucial period for us." Hull: Shaul; Crookes, Crooks, Yeaman, Talanoa; Rankin, Miller; Paea, Houghton, Bowden, Ellis, Hadley, Westerman. Replacements: Paleaaesina, Heremaia, Thompson, Tuson. Wakefield: Sammut; Mathers, Ryan, Walshaw, Riley; Sykes, Siejka; Anderson, Anderson, McShane, Scruton, Washbrook, Kirmond, Smith. Replacements: Moore, Molloy, Godinet, Fairbank.